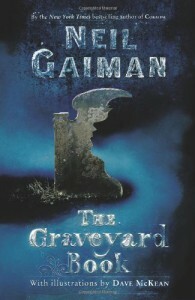 "The Graveyard Book" is the first work I read by the author Neil Gaiman. I was especially impressed with the Newberry Medal sticker on the cover. And so my expectations were high. First, an overview. This story begins with sad and sinister deaths of most of the members of a family, except our main character, who is little more than a toddler. The child finds a graveyard, where the dead and/or undead inhabitants take him in and raise him. We meet various characters, living and non-living, and then the mystery of the murders takes the main stage. By the end of the story the mystery is solved. I liked the author's style of writing, with its smooth form and flow. I enjoyed the adventures I shared with the main character as he went through one daring exploit after another, trying to grow up and learn in a unique place. Several minor characters (including the bad guys) were colorful and memorable, and so stood out. The plot was progressive and at times filled with tense action sequences that kept me wanting more. The illustrations were good, and helped to set the tone of the story. There were a few things that bothered me, however, and that's why it only earned three stars. First of all, the main character was flat. Even in the most dire of circumstances, his reaction was simply, "meh". In other words, he didn't act like a child his age with the range of emotions everyone is born with. In fact the main emotions I remember were when he was slightly sad. He reacted with the voice of a mature adult. I found it hard relating to him as a main character. Next on my list was how the author seemed not to know how old the boy was. This was more of an organizational problem, where in one place the child would be, say five years old, but later he could not have been that old because two years had gone by. He was not seven, but six or eight, or some other such number. I noticed this a few times, and it pulled me out of the story. Some of the scenes were thinly described, making it difficult for me to imagine how things would have appeared--such as the ghouls adventure. More detail would have made it better. Toward the end, the author would drop, out of order, a partial scene involving other characters doing something else (never fully explained) thus sending a jarring wave of transitional irrationality through my brain. Fortunately this did not happen often. Because "The Graveyard Book" won a prestigious award, I have to admit that my expectations were not entirely met. But I do recommend the story as a good read for those who want to enjoy a juvenile story with mystery and some action.